eHow is Looking for Writers of All Levels to Contribute to Their Growing Library of How-To Articles! Would you like access to over 17 million people a month? Write for eHow and put your work in front of this highly engaged audience while also earning money for your articles. 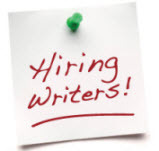 Become an eHow Writer Today! Joining our writer community is fast and simple. Once you register and opt in to our Writer Compensation Program, you can immediately start uploading articles and making money. As part of our Writer Compensation Program, eHow Writers make money on the articles they submit. Payments are generally based on the traffic the article receives and the quality and uniqueness of the content. We also encourage our writers to promote their articles on their own websites and blogs. Our easy to follow article template helps you quickly format and upload your articles. You choose the title and write the body of the article by filling in detailed step-by-step instructions. Add any tips or images readers will need to complete your How-To. Then pick a category, and you're ready to submit. eHow Writers enjoy these benefits and more! 1. Visit eHow.com and create a user account. 2. Remember to opt in to our Writer Compensation Program by filling in your payment details here. 3. Pick a topic and start writing! Give it a shot, it's FREE to sign-up!